Haakman Flowerbulbs started in 1938 as a traditional West-Friesian vegetable farm. Since then, the company has grown into a specialist in the export of tulips intended for forcing, with its own tulip nursery and a branch in New Zealand. Haakman also supplies bulk tulips intended for the dry sales market. 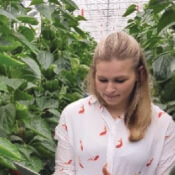 Recently, Haakman deployed temperature and humidity sensors in its breeding location near Moscow, Russia, enabling the company to share real-time insights on breeding conditions with colleagues all over the world.